At FYF, Solange burst out on stage in a dramatic red Gareth Pugh gown, and some equally bold red eyeshadow to match. People are like '???? ', but I felt a kinship: the only color eyeshadow I'll wear is red. I swore off the stuff entirely after a particularly tragic middle-school picture day, when an illicitly applied smoky eye fled my lid and struck out southward, congealing into immoveable piles of gunk under each eye. When the photos arrived a few weeks later, I was grounded, and my Maybelline shadow palette was confiscated. 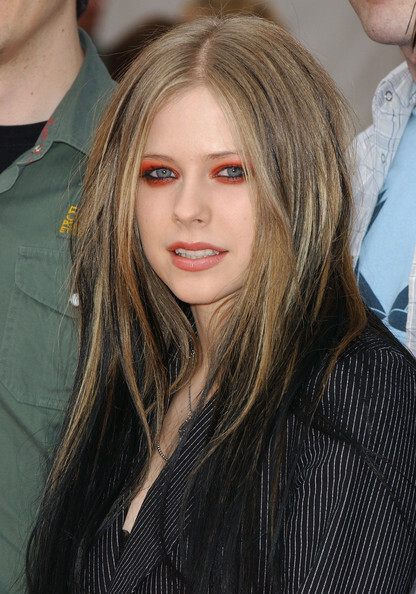 I don't know when I fell back in love with the idea of saturating my lids with pigmented powder, but it was well after Taylor Momsen and Avril Lavigne temporarily ruined red eyeshadow for everyone. These days, I keep my preferred red (a matte, subtly orange shade called "Cherry On Top") around for when I'm in need of a punch-up. Just take your grubby finger, swirl the shadow evenly on and above your lids, layer liquid liner along the lash line, apply mascara, and you're done. Best of all, red—be it leaning towards the hot pink or tangerine ends of the spectrum—looks good on everyone: pale skin, olive skin, dark skin. It's a lot sultry, a little aggressive, and slightly unhinged. Its effects are almost always in a sweet spot between unnerving and entrancing. Solange knows, and now you do too.